This is the fourth episode in the series, where I introduce you to members of the TYPO3 community. This weeks fellow is Riccardo De Contardi. Please give him a warm welcome and read on! Marcus: Hello Riccardo, thank you very much for participating in the interview and taking the time for answering the questions. Riccardo: Thank you, I feel excited. Marcus: How did you get in contact with TYPO3? Riccardo: I discovered it at work. The CTO, of my company at that time, asked me to learn and to use this CMS. He was also a developer and did the first projects with TYPO3. So I started to work with it and developed these projects further. To be fully honest the first times, I hated it! That’s true, but mainly because I did not understand anything of it. Marcus: How do you contribute to the community? In which areas are you active? Marcus: One main topic of your activity is to clean up forge.typo3.org, the bug tracker of TYPO3. Is there a possibility to support your activities? If yes, how can people support you? Riccardo: There are still lots of old issues. Many of them are very hard to reproduce (due to bad issue descriptions). Another large block are issues, where it is not clear, whether they are still present or not. Marcus: The next question probably would fill an own blog post. But maybe you can sum it up in a couple of sentences … Which information should an issue on forge contain, so that you (and the core devs) can easily work with it? circumstances under which the issue occurs including information about the system (or the browser used). I am sure that a core developer could think of other things to add to this list. Marcus: These are four points I will take on my checklist, when filing an issue. Thanks for nailing that down! Do you have any TYPO3 events on your agenda, where it will be possible to meet you in person? 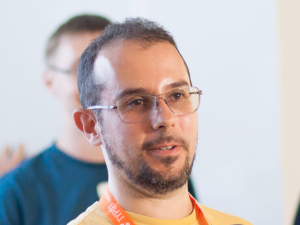 Riccardo: I will attend the T3Camp in Vienna on 24-26 March and I will be probably at the next TYPO3 Developer Days in Malmö. Marcus: Did you already have a chance to participate at a TYPO3 event? If yes, which one was it? What was special about this? Riccardo: Years ago, I attended some TYPO3 Camps in Italy and the CertiFuncation Day 2015 near Cologne. I also attended the last Developer Days 2016 and T3Con Italy 2016. I remember with pleasure the CertiFuncation Day, because it was my first travel to Germany. And because there I’ve met Mathias Schreiber, the person who “enlisted” me for the TYPO3 Army just a couple of months before (2 or 3 months before IIRC). This is a real honor for me. And of course the T3DD: it is a really awesome experience and I recommend everyone to attend it. Marcus: Do you remember a nice and / or funny epsiode (anecdote), which you would like to share? Riccardo: I don’t know if I can tell you :-) Well, ok I’ll tell you anyway! I already told you about the CertiFuncation Day where I met Mathias for the first time by person. Marcus: What other activities and hobbies do you have besides TYPO3? Riccardo: I like reading (also comic books, I guess this qualifies me as a typical nerd). Sometimes I play billiard with my father. I mean, Italian billiard, not the American Pool. Marcus: Thank you very much for the answers! Hopefully this interview helps to get to know your person and to find some people who jump in and help you with cleaning up https://forge.typo3.org. I am really looking forward to meet you at the T3camp in Vienna in person! Thanks to all who were reading until here. I hope you enjoyed the this issue of “Friends of TYPO3”. If you have got more questions, I should ask, please drop me a note. Also if you know somebody, who should be interviewed. You can contact me via Twitter (@MarcusSchwemer), e-mail (marcus@typo3worx.eu) or TYPO3 slack (@mschwemer). If you liked this blog post, I would be happy, if you share this post via your favorite social network. For convenience, you can use the share buttons at the end of this blog post. Thank you very much for your support! I think this series is great idea, Marcus. Loved reading this and hoping you will publish more! And Ricardo, thanks for your continuous great work. It is very motivating.